Full grain leather upper with velcro protective overflap. 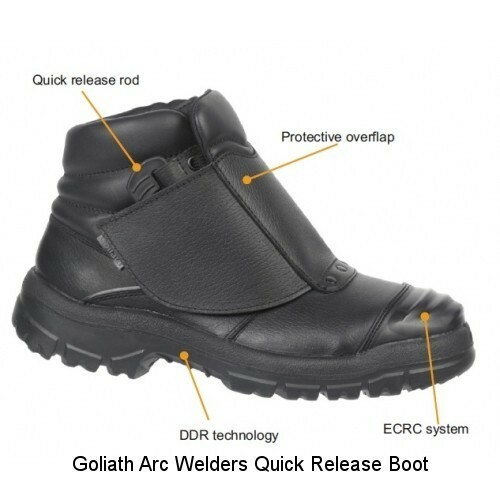 New and improved flame resistant Dual Density Rubber injected sole with new high side wall. Heat resistant through the outsole and midsole to 300 degrees centigrade and SRC slip resistant.. Flame resistant stitching. Lightweight aluminium toe cap resistant to 200 joules impact and Tex nail-proof textile midsole for 100% coverage of the foot. Open cell PU footbed. 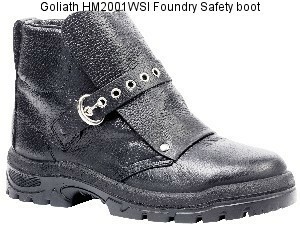 Meets European foundry footwear safety standard EN ISO 20349:2010 S3 HI HRO SRC Fe. 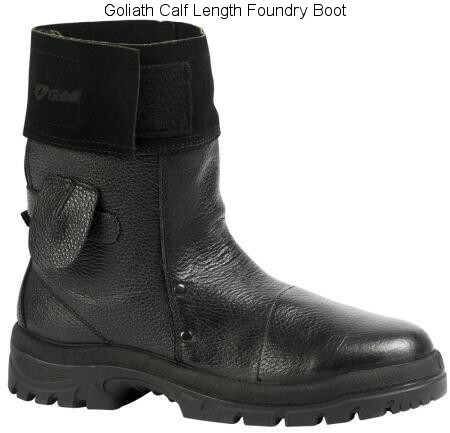 Goliath SDR905CSI Metatarsal Safety Boots. Ideal for working where there is a significant risk of weights falling over the top of the boot - steel stockholders, farriers scaffolders etc. The main feature is a flexible metatarsal protector utilising the revolutionary D30 material. This material solidifies within microseconds of it receiving a blow. In addition to these features they also have a dual density injected rubber sole resistant to 300 degrees C.
Full grain leather upper with a bump cap on the toe to offer greater longevity. Flexible Lenzi puncture resistant textile midsole. Quick release rod system for rapid evacuation. Heat resistant to 300 degrees C.
Deep cleated sole with ladder grip for sure footing. They have a moisture wicking lining to the vamp. All other areas unlined for maximum comfort in hot conditions. The sole is a dual density rubber (DDR). The upper material is a splash resistant chrome tanned leather upper. Quick release fasteners for rapid removal in case of molten metal splash. Velcro fastening to suede collar for comfortable wear in every use. 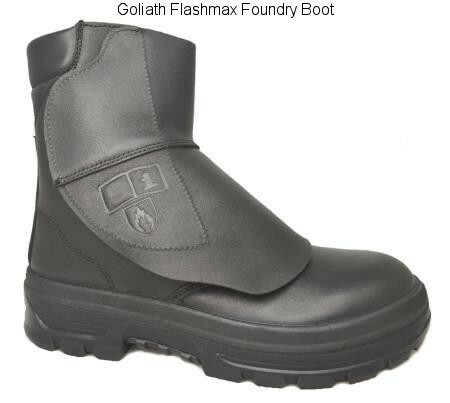 Black leather 200mm (Type D) foundry boot. Suitable environments: Foundries, welding, steel stockholders and glass works. Meets EN345 and BS 4676 (Type D).